We are very, very close! Thank you very much for your contributions and your prayers this past month. Your continuing support is essential to our mission. Thank you! July brought a little bit of everything. Blue skies, hard rain, dense smoke and several days of drizzle and fog when the daytime highs were +49° and the daytime lows were +48°! Miraculously, the weather always cooperated whenever we'd scheduled outside work. Thank you, Lord! Meanwhile, all of the heavy items for the new building arrived safely and are now secure inside the new building. We offer our sincerest prayers of gratitude to everyone who is helping to make our upgrade to 25,000 Watts possible. Full size (18k jpeg) HEAVE-HO! On August 1st, Randy Pomeranz�s crew gently hoisted the largest of the huge transmitter crates into the new building. This carton weighed 1,300 pounds; the other three weighed 700 to 800 pounds apiece. Our thanks to Sitnasuak Native Corporation for the fancy hydraulic forklift. Since last month, KNOM has broadcast 2,830 Inspirational Spots and an equal number of educational ones. We've faithfully aired the Rosary every evening, Morning Prayer programs twice a day, plus hours of inspirational talks, the Mass, and lots of news, discussion of vital issues, documentaries and interviews. Thank you for making this mission to remote western Alaska villages possible. Please consider adding missions like KNOM to your will. Your generosity can help vital work of the Church survive far into the future. God bless you! Full size (17k jpeg) 4,000 POUNDS of equipment sit on top of a flatbed truck in front of the KNOM studio building, just before the 3-1/2 mile trip on the gravel Nome-Council road to the tundra transmitter site. Les Brown poses with the heavy load. 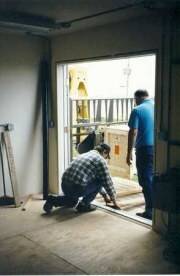 It's Les and Tom Busch who are installing the new system. top of page The last 400 feet of the equipment's journey was the toughest, guiding the flatbed truck backward along KNOM�s narrow and extremely bumpy and rocky driveway. Workers had to be especially careful not to tip the truck sideways, lest the top-heavy load pull the truck over. 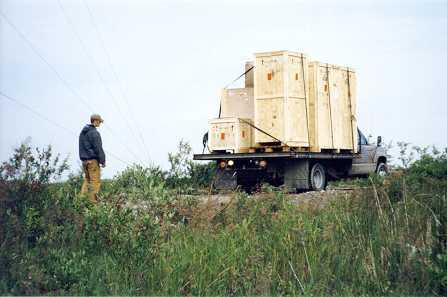 The entire transmitter is visible, shipped in the two tallest crates. 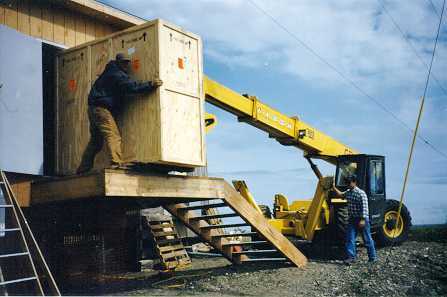 The short crate at left contains the transmitter's 720-pound power transformer. To the rear is the immense antenna tuning unit. All of the gear was delicately placed inside the new building August 1st and uncrated on August 2nd. INSPIRATIONAL SPOT: We never want to underestimate the miracles of grace worked in the lives of ordinary people set aflame by the personal experience of Jesus and His mission. 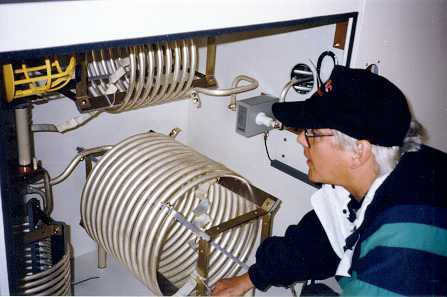 Full size (15k jpeg) KEEPING CURRENT: KNOM general manager Tom Busch checks the inside of the new antenna tuning unit, where massive coils were designed to carry the high current of the 25,000 Watt radio signal to the antenna. 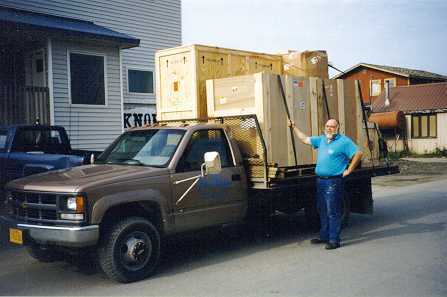 The assembly was built by Kintronic Laboratories of Bristol, TN. THE "ARMSTRONG" METHOD: (Left) Electrician Roger Augdahl positions lumber at the building entrance to haul the power transformer the final few feet by "Armstrong" (we all tug by hand!). Les Brown, pictured, Tom Busch, and one of Randy�s workers provided the muscle. INSPIRATIONAL SPOT: Hope looks for the good in people instead of harping on the worst. Hope opens doors where despair closes them. Hope discovers what can be done instead of grumbling about what cannot be done. Hope draws its power from a deep trust in God and the basic goodness of human nature. Hope regards problems, large or small, as opportunities. Hope is a good loser because it has the divine assurance of final victory. Full size (16k jpeg) �HERD� THE NEWS? 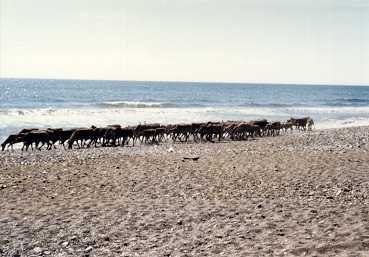 In July, a herd of about 400 reindeer made the golden beach of Nome their home, wandering between one and three miles from town. According to reindeer experts, reindeer hoof it to the shore once in a while, looking for salt from the Bering Sea. top of page A hearty thank you to 1993-94 KNOM volunteer Stephanie Welsh (left). 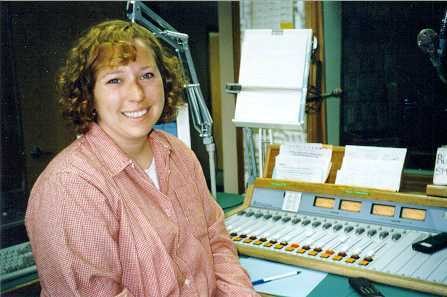 In Nome for a visit, Stephanie generously filled in for Tom Busch on the air, allowing Tom to devote his full energy to the transmitter replacement project. Thanks, Stephanie! THERE'S LOTS MORE GOING ON, like the 50,000 acre tundra fire only 50 miles northeast of Nome, and the 500,000 acre fire about 250 miles to the southeast, a call-in program on subsistence hunting and fishing, but we're completely out of space. With good fortune, we will be transmitting from the new building about August 15th, first with 10,000 Watts, then 25,000, possibly in September. Thank you again for your generous contributions and your prayers, both of which we need to keep our mission work thriving. We know that Our Lord will bless you a thousand times over.